The wild and wacky world of fractivism produces strange new things (really recycled things from an old playbook) every day. It’s a virtual Frack-O-Mania competition and periodically we’ll keep adding entries to entertain our readers, allowing you to rate each on our wild and wacky scale. 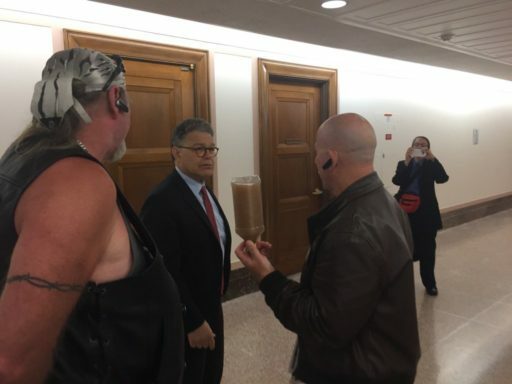 Check out this photo of Senator Al Franken (the distinctly unfunny former clown from Saturday Night Live who now makes a living at taxpayer expense being a DC clown), as he’s confronted by two of the bigger clowns in the fractivist movement; Craig Stevens and Ray Kemble. Craig, of course, is doing his fractivist schtick while apparently taking orders from Food & Water Watch in that permanently attached earpiece, and holding a bottle of water upside down to be sure the sediment is stirred up nicely for maximum effect. Ray is there to offer an accompanying dose of shock and awe as poor Al tries to figure out what to do. Barnum & Bailey’s yet lives! How would you rate this on the wacky fractivist scale? Keep It In the Ground? Where Do You Think the Power Overhead Comes From, You Dolts? 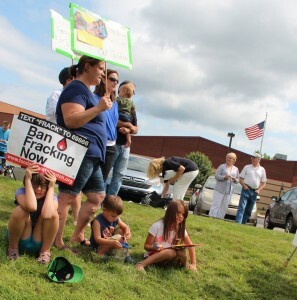 The infantilism of the fractivist cause is captured by this NRDC tweeted photo of protesters at the Crestwood proposed propane storage facility in Upstate New York. Check out the electric power transformers over the head of the protester holding the “keep It in the Ground” poster. One wonders what idiot at the NRDC failed to notice the irony before tweeting this photo. Is there no shame among fractivists so wedded to their ideology that they will exploit kids to sell their political agenda? Apparently not, if this State Impact photo of a fractivist protest in front of a Mars, Pennsylvania school is any indication. State Impact, of course, is funded by the same people behind the protestors, which doubles the exploitation. Is this exploitation of children? Laura Ingraham raises a great question. Was that Pajama Boy who Stuart Varney threw off the set of FOX News the other day? It certainly takes someone that gullible to believe lighting faucets on fire didn’t take place before fracking. Could it be? 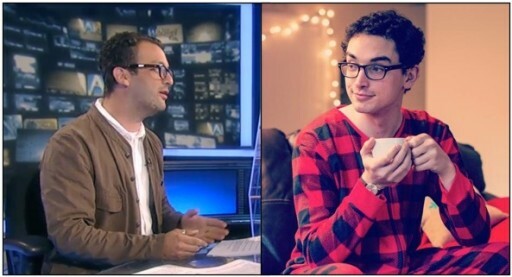 Is Josh Fox Really Pajama Boy? Celebrities love trendy causes to which they can attach their name in hopes of further attention and recognition for something other than their shallow craft. Mark Ruffalo is such an individual – the prototype celebrity fractivist who wants everyone to go solar like him at great expense and even greater public subsidy. Unfortunately for him, holding up up a jug of brown Dimock water that, when tested by EPA, failed to show any fracking chemicals doesn’t provide an ounce of credibility, except with other fractivists and equally shallow and emphatic media types who just love spoiled stupid celebrities. 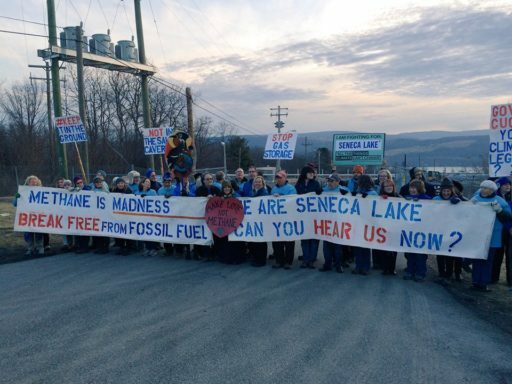 Unfortunately for Upstate New York residents, these are the folks, of course, who guided New York Governor Cuomo in his “scientific” decision. 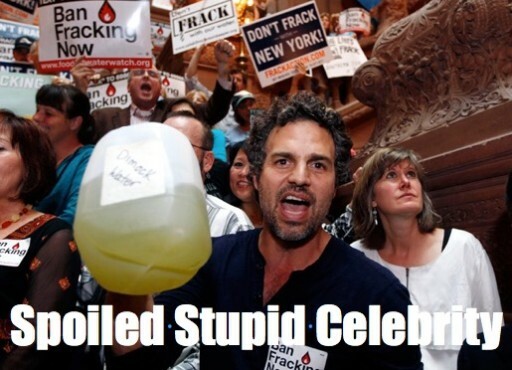 How credible do you think Mark Ruffalo is on the subject of fracking? We always hesitate to promote Vera, as that is what she seeks, but the entertainment value of this video is just too rich to ignore. See for yourself and look carefully at the other people there. Is that the Sierra Club’s Roger Downs in the background with body language screaming “What the hell am I doing here?” – looks like it. Well, Roger, that’s what they pay you for; to organize this kind of nonsense. How would you rank this on our Wild and Wacky scale? The Delaware Riverkeeper recently sent out an appeal in the form of an Action Alert to its supporters (“E-Activists”). 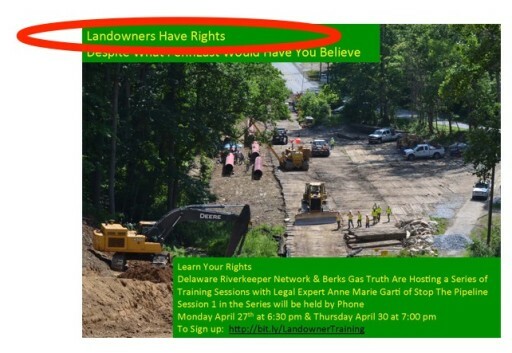 Lo and behold, after years of pretending landowners don’t exist and undermining their interests in simply harvesting their natural resources, the Delaware Riverkeeper has suddenly recognized landowner rights! “On display in Vermont.” – that actually makes sense. The governors plan (Shyster? – Slumlord? – Shimlin?) for replacing Vermont Yankee electricity included the category – “we don’t know” for about 1/2 of it. Where the largest city, Burlington, in “going green” will import wind electricity from 70 miles away (NIMBY even to fellow residents) and hydro from Maine. I still haven’t figured out how they get the wiring from Maine to Burlington, VT. In January, Vermont generated a whopping 35% of the electricity they used. I’m in New Hmmpshire where we probably generated that electricity burning coal in Merrimack. I swear I can smell the wires burning. How come one grandmother can create so much Fear !! …Carry on Vera .it’s working well !! It shows just how radical these fractivists zealots have become! Learn what ( what you want us to believe ) you need to learn what actually takes place in a ng drilling area instead of thinking about getting rich !! To paraphrase my reponse to one of your similar previous posts, you should not misconstrue the reportings of, and comments on, Vera’s (or any Antis’) activities as a sign of effectiveness any more than one would consider a misbehaving, lieing, screaming, tantrum throwing child effective for being told, “NO! You can’t have your way!”, by his mother or for discussed between the mother and father. Do not confuse attention with credibilty for while Vera might have the former she does not have the later. And neither do you. And by the way, I’m still waiting for my first “tremor from an earthquake. I think you are jealous ! !Amazes me how low people can go to get what they want and think they need . I am a youth against fracking, and I am laughing hysterically at the stupidness of this! Look at the science and thanks for the laugh. If you looked at the science you’d be on our side Penelope. Penelope, if you are so opposed to hydraulic fracturing please explain the process and how long it takes hmmm? 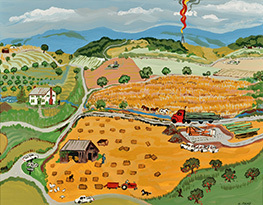 After a two-week trial at the U.S. District Court in Scranton, the federal jury found that Cabot Oil & Gas Corp., one of the largest natural gas drillers in Pennsylvania, had polluted the families’ well water. The trial proved the opposite, which you’d know if you read our posts on the subject. It is interesting that you think “fractivists” have something to gain besides a cleaner, safer, world. Can you explain or validate your claims? Where you have come by this perspective? Clearly the Shale Gas industry has something to gain and much to lose in this fight, but what leads you to believe the people who oppose your industry have anything besides humanity and ecology at interest?